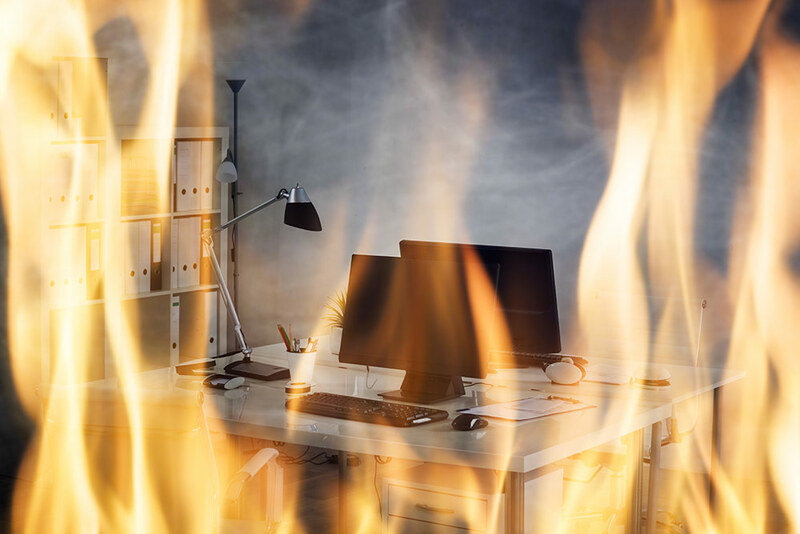 So, what are the most common causes of workplace fires? How can you help to prevent them? A quarter of workplace fires are caused by faulty or incorrect use of electrics – perhaps overloaded circuits, poor workmanship or a lack of maintenance. Make sure any electrical work is carried out by an electrician and ensure your PAT testing is up to date. Also, remember to discard and replace any broken equipment and avoid the use of extension leads wherever possible. Another common cause of fires in business buildings is due to misuse of equipment – heaters too close to combustible materials, drink spillages on electrical items or leaving computer equipment on flammable surfaces. Accidents do happen, but staff training will help to keep these to a minimum. Inappropriate storage of waste and other combustible materials is another potential cause of fire. Remember to empty bins regularly and keep exit routes in particular free of flammable materials. At work as well as at home, smoking is a potential fire hazard, so ensure staff keep smoking to designated smoking areas away from the building and provide ash bins for the safe disposal of all waste materials. Storage of flammable liquids such as glues and solvents is vital to fire safety as they are liable to combust unless stored and used properly. This also includes any other hazardous materials such as paints and chemicals. Even the smallest office kitchen or canteen needs to be kept clean and free from flammable waste. If appropriate, make sure someone is designated to wipe out the microwave or oven on a regular basis: burnt on food deposits can catch fire eventually! Arson is by no means the least cause of fire so keep outside accessible areas free from combustible material, and consider CCTV if the local crime rate makes it appropriate. Put your Fire Risk Assessment and fire safety training to good use – keep those fire routes clear, never wedge fire doors open, ensure the fire extinguishers and alarm system are regularly tested and make sure you have enough staff trained to use fire extinguishers should the need arise. What should I do to reduce the risk of arson? Where can I get guidance on fire precautions in my building? How often should I carry out a Fire Risk Assessment? What do I need to check on a fire door?